The old, red dog just stared out at the mountain. He stood right at the edge of the fence, at strict attention, as he scanned the silent fell. He took no notice of the others, he never did. He was looking for something, but nothing he could see. He was always looking for something. His vigilance seemed eternal. The old man emerged from one of the buildings, just outside the perimeter of the kennel complex, carrying a brown, cardboard box. As he approached, the old dog ignored him, as well as the others. They were all vying now for the old man’s attention, pawing the fence, and standing upright, shifting as a column, following his every movement, crowding the old dog. Still, he stared off into the distance, as if he were in a separate dimension, on an entirely foreign, existential plane. There was no pettiness in him. I thanked the old man for bringing us the frozen lamb flanks, and saving me the walk. After I had put the dogs up, the old man hung around, as I chopped up the stew vegetables, and threw a weighty lamb flank into the stew pot. It wouldn’t be too long before the aroma would overpower the sharper smells of liniment and citronella. “That red fellow, the one who was staring off into the distance…who is he?”, the old man asked. Most of other trainers thought the old man was a crank. He was always around the kennel compound. He would volunteer to walk dogs for anyone who was too lazy or busy to do it for their own selves, and that was, for some of them, a source of perverse amusement. “Let me take him for a walk”, the old man only half-asked. “Sure, go ahead. Have at it. It’ll do both of you some good”, I said, smiling at them, as he leashed Rusty up. They went off toward a swift, north-running river in the nearby wood. I had no idea how long they’d be gone, but I had enough to do to keep me busy until they returned. As they grew smaller, I noticed that although he must have been near eighty years of age, the old man had no trouble keeping up with Rusty, who just glided over the grass, as if he were no heavier than a handful of fairy dust. Though the season was young, it had been a disappointing meet so far. I didn’t have much to work with, and I suppose the dogs felt the same way. No amount of training, conditioning, nutritional supplementation, grooming, massage, or even prayer, seemed to be enough to coax any sort of performance from most of them. They were as happy, well-fed and as relaxed a group as you might ever encounter, but still, they declined. Rusty’s arrival had given me some faint hope, but sadly, he was not now even a shell of the greyhound he once was. The tenacious chaser, who had gone eyeball to eyeball with some of the elite racers in the Northeast, and had given back as good as he had ever taken. Even the pups were mostly all morning glories. Under the night lights, they wilted. My lingering self-pity session was interrupted by the return of Rusty and the old man, who were both now standing within the turn out pen. The old man spoke softly to the red dog, in his lilting, whimsical brogue, as Rusty looked up at him, with great interest, not even panting. I washed my hands, and then went out, through the screen door, to join them. “Oh, we managed to scare up a few rabbits, some squirrels. It was a grand time, wasn’t it, lad?…there, there…right you are, Rusty!” And then, the old man pinched Rusty’s rump, and Rusty did a few helicopter spins in acknowledgement. I knew what this meant. Rusty would go home with old man, to his dark-cedar shingled cabin at the base of one of the nearby mountainsides. There were green fields, and rippling ponds, briar patches, and a Guernsey cow named Molly. There was a front porch where you could sit back in a rocking chair, and look out at a landscape so green, serene and enchanting, that you began to believe that anything was possible there, though nothing else was required. It was all so peaceful and pastoral, you inevitably searched for the picture frame at the perimeter of your vision. It blurred the lines between fantasy and reality, and though you were outdoors, oddly enough, it felt as if you were indoors. It was as if you had somehow wandered into a John Constable painting. The old man had a gift. 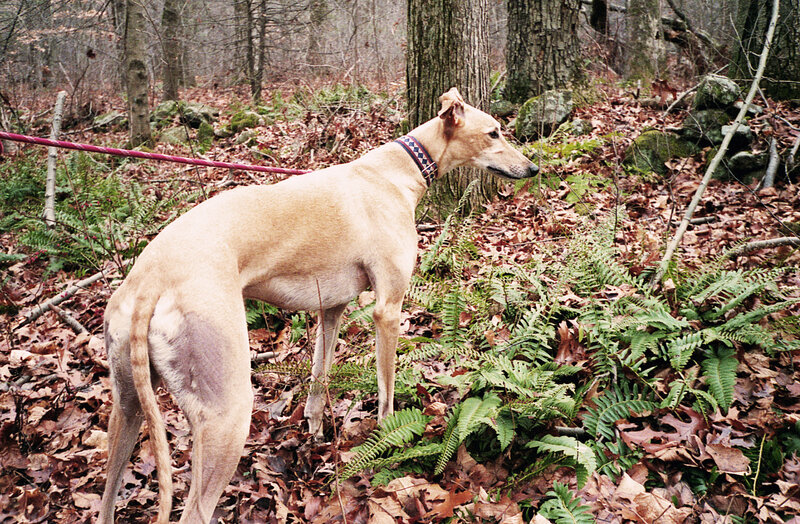 He had grown up as a master of coursing greyhounds. His other gift was a vocation, which, for the young man he once was, took precedence over his more trifling pursuits. I never learned why he had eventually given up the priesthood, but I doubted that he was as good a priest as he was a greyhound savant. It was eerie, the powers the old man possessed. He could watch a greyhound just milling about in the turnout pen, and in five minutes, he could tell you everything you already knew about the dog, and several other things that would later make you begin to feel that he might be possessed by a spirit from another world, and that you were completely oblivious to what should have been obvious. And I guess that is why Rusty, with his class and otherworldly demeanor, had caught his eye, immediately. I would have to get over to the racing office, pronto, to take Rusty off the active list before he drew in again for another race. I handed Rusty’s muzzle to the old man, and walked with them to his car, a 1963, olive-green, Oldsmobile Starfire, which was in near showroom condition. And off they went. It was a couple of weeks later when I drove out to the old man’s place. The road ended about 100 yards from the break where the cabin was situated, on the south side of the mountain. I could see Rusty and Molly in the grassy meadow that ran from the cabin to the rise of the mountainside. Molly was happily grazing, barely batting a Liza Minelli eye, and Rusty came gliding over to see who had arrived. When I got out of the car, Rusty and the old man came up to greet me. We walked into the cabin, which was lit only by a small fireplace, with flickers of flame, soon to expire. The mantle was bare, but for a small, cheaply-framed, sepia-toned photo of a striking red greyhound, being led across a field, by a trim, lean-faced young man in black garb and a clerical collar. The old man was heating something on the stove, and Rusty quickly lost interest in that, retiring to the rug in front of the fireplace to chew on a knuckle bone that was waiting there for him. He had made himself perfectly at home in rather short order, it seemed. The sharp edges of the ever-vigilant sentinel were gone now. The old man walked over to Rusty and placed a packet of something in the depression next to the base of his tail, holding it there in place, as he sat down on the rug. Rusty continued to gnaw on the bone, barely acknowledging this intimate intrusion. “He sores up in the tendons there. A dog can’t begin well when he’s got discomfort in that spot. This is a Hawthorne Root poultice. It takes the inflammation away…nothing fancy, mind you. You should have seen that. I’m surprised at you. I thought you would have. You know, they all gave up on him. So he started to believe it. So did you, I guess. Things like that can become a self-fulfilling prophecy. But you know who this dog is. That doesn’t go away, just because he’s got some age to him. You have to wring it out of them, they don’t give it up that easily. They’re not machines. This is a special dog. You can see it in his hide. You can see it in the way he carries himself. You can see it in his eyes. He needed to be reminded. That’s all. I’ll bring him by tomorrow. You get him sorted out on the track. Take a few of these poultices with you”, and the old man handed me several cheesecloth packets he had made up. I said thanks and goodnight, and headed back to the kennel, duly chastened for my perceptive lassitude. The next day, when the old man arrived with Rusty, I noticed that he did not take up his usual lookout post, but instead, just nosed around the pens, and after watering the fence in several places, looked to be let in the kennel. I had prepared a freshly cut bed for him, and he dove right into it, quite pleased. Rusty went .03 seconds over the track record in his official schooling race, before going back on the active list. He went on to have a brilliant final season to his career, even managing to defeat, on two separate occasions, a greyhound who was to be voted onto the prestigious All American Team, and who became a multiple stakes winner, after being sent onto bigger and better things in Florida. And he never–not even once again—stood gazing out at the lonely mountainside, searching. No doubt, and thanks to the old man, he had found what he was looking for. And what he was looking for, was Rusty.